The new Special Forces Stealth Grey features the company's proprietary Gen III finish, a non-glare thermoset polymer coating that offers excellent wear resistance and corrosion protection. Black Gen III on the slide and gray on the frame. 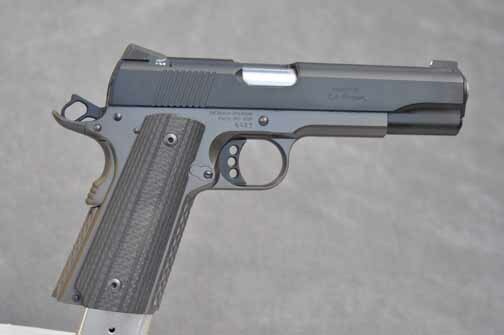 Ed Brown offers 1911s in several different configurations, and the Special Forces is one of its most popular models. A new version of this model, the Stealth Grey Special Forces, is now available. A five-inch Government model in .45 ACP, the Special Forces is built to withstand rough use in extreme conditions. The pistol starts with a hand-fitted single-stack frame and slide to which is added one of Ed Brown premium match-grade hand-fitted barrels. There was absolutely no play between the frame and slide, and the barrel locked up tight. The Special Forces has a standard bushing and unramped barrel, and no extended guide rod. installed. The Ed Brown beavertail puts the hand higher on the gun than any other design, and choking up on the gun is one of the most important things you can do to tame recoil and get back on target quicker. The raised Memory Groove section helps make sure the grip safety is fully depressed even if you have a less-than-ideal grip on the gun. up in the hand under recoil. Stealth Grey is Ed Brown's new Gen III finish color, Gen III being the firm's proprietary severe-use finish. It is a thermoset polymer coating that provides exceptional corrosion protection. Wear is significantly improved over standard bluing, and it has the appearance of finely finished bead-blast bluing. The frame of the new model is finished in the new Stealth Grey color while the bushing, trigger and slide are treated to black Gen III. The Stealth Grey comes with distinctive carbon fiber grips that are charcoal gray in color. They are "smooth," but with the layers of carbon fiber the end result is not quite smooth. I prefer this, as completely smooth grips can make a 1911 quite slick in the hand. The serrations on the rear of the slide are square cut, which means they are very effective. The Stealth Grey SF's single-sided thumb safety clicks up and down with authority, just the way I like it. The pistol comes with snag-free white outline night sights, which were quite bright in the dark, and the mag well is beveled to facilitate smoother reloads. Shooting the SF Stealth Grey brought no surprises. First, the pistol's trigger broke at a very consistent 3.25 pounds, making accuracy testing easy. Sub-two inch groups were the norm, and at 25 yards the rounds were hitting exactly at point of aim. I had no reliability issues with any kind of ammo I fed it. My only complaint with the Stealth Grey Special Forces isn't with the gun; it's that it is only supplied with one seven-round magazine. While that mag is an excellent Ed Brown complete with base pad, Ed Brown Products does make an eight-round magazine as well. 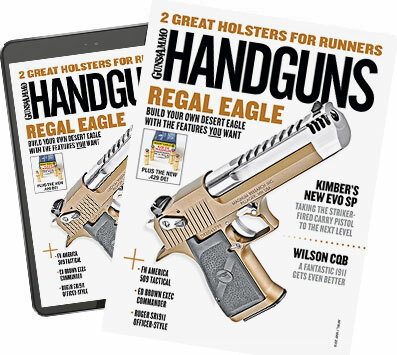 For a suggested retail of $2,345, I would think the gun should come with at least two mags—at least one of which should be an eight-rounder. Smallest group: Wilson XTP 230 gr.—0.9 in. Largest group: Remington UMC 230 gr.—2.2 in. Average of all ammo tested—1.42 in. Accuracy tested at 25 yards. Four five-shot groups.